Ibrox Noise: Why does Steven Gerrard keep making this same mistake? Why does Steven Gerrard keep making this same mistake? There has been a lot of meltdown over last night’s diabolical display against Aberdeen from fans of a Bluenose persuasion, and we decided to sleep on our own takes on the performance and result before committing quill to parchment. And one curiosity we remain puzzled by, outwith the ineptitude of the fare on display, is the continuing selection of the absolutely hopeless Lassana Coulibaly. The Mali international peaked during late July early August, and following his injury against St Mirren on the 12th of that month, hasn’t been seen convincingly since. One, maybe two passable matches since his return from that fateful thigh injury and the on-loan Angers man has otherwise been an absolute passenger, which is plain for everyone to see. And as one comment rightly said to us yesterday; ‘Steven Gerrard has forgotten more about football than you’ll ever know’. So why is he continuing to pick a complete hopeless case? There is no doubt that briefly we absolutely adored the likable midfielder – his form was destructive and he was putting in a tonne of work in midfield – gritty work that his team mates especially appreciated. But on his return it’s 80% vanished and we honestly have no clue what he’s bringing to the Ibrox table. Or why Gerrard is continuing to let him try. It’s evident we have much better options, albeit we concede last night Arfield’s suspension was a big miss – but there were plenty of other options Gerrard could have deployed over Coulibaly – Ross McCrorie or Jordan Rossiter (ironically back on the bench following our puzzlement about his recent absences) could have been a much better bet than Couli, but somehow the 22-year old seems to be a pet favourite. It’s absolutely 100% time to ditch Coulibaly back to France and start using our own talent. And Ejaria is even worse , he doesn`t even run about tackling like Coulibaly does .A complete waste of a shirt. Article on Ejaria published in 10 minutes. ...What we got to Lose? Totally agree about Halliday , he has never got the chance to play his proper position with us .He drives forward and likes a dig so why not try him there.He could have been brought on for Ejaria last night. McCrorie too deserves a start .They two plus Jack for Sunday. 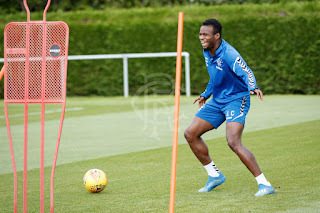 It seems odd to me that some see the solution to Coulibaly is Halliday. A player everyone wanted out the door not so long ago because he wasn't good enough for Rangers and said we would never win anything with people like him in the team. What's changed. I also agree that McCrorie should get a run instead of Coulibaly but I found it very telling during the Villarreal game that Gerrard seemed reluctant to change the team in the last 30 minutes when we were down to 10 men and running on empty. That tells me the players on the bench didnt have his confidence and McCrorie was one of those players. Yes and Lafferty, Rossiter and Pena, too. The Rangers curse, strikes again. They start great and then.... I'm SICK of the empty jersies and SG simply saying "it's not good enough" whilst NOT, punishing them. It's starting to smack of Murty-weakness. Empty-jersey-itus can not, continue at our club. Besides anything else, it's a drain on our restricted finances. Don't think i'm advocating anything. I think SG has done a magnificent job, so far. But I still think he's weak on benchings. Players need to be told they're shite, when they are. Should not be cosseted from reality. Wrapped up in cotton-wool, in their safe spaces. Alex Ferguson knew how to deal with empty jerseys.